I've included a list of pony sets, arranged by set/date, to also include a definitive set of "came with" info. This is not be a complete ID guide, or anything of that nature, as my set is not complete (I don't have that much space). I will, however, try to include details of all ponies in any sets that I own some from. This will be a UK guide only (unless otherwise specified). Note: height measurements are from bottom of hoof to top of head. I do not own ponies or items marked in DARK GREEN. Another note: do not try and identify a pony by the date on the bottom of her hooves. This is the date that the mould was first used, not the date your pony was made! If you want to catalogue your own collection, use my filing card blank; you'll need Adobe Acrobat Reader to view it. UK MLP Activity Club - Separate page, listing items year-by-year. In 1981, Hasbro brought out a set of large (12" tall) hard plastic ponies with ears that moved, that looked a little like Peachy or Butterscotch and one in brown with white details. These were called My Pretty Pony. I don't remember ever seeing them at the time, but I now have Brown MPP. They were distributed by Pedigree in the UK (the company that used to make "Sindy"). The first "proper" set of My Little Pony (note: Butterscotch was first made as a baby for the larger My Pretty Pony). The first 6 had short legs with flat feet (and didn't stand up well). These were re-released for mail-order with slightly longer legs and concave feet. The US didn't get the mail-orders until 1985/6, but I believe the were in the UK from approximately the same time as the flat-foots. I remember seeing the details on how to order them in the "Twinkle" little girls' comic I got at that time, which was advertising the ponies. Each pony came with a "puffy" sticker with her name and picture on it. I didn't get any of these new, so no comb colours known. Information source: ponies owned, and leaflet that came with mail-order collectors' set. (Incidentally, this leaflet shows ALL 6 with dots for markings, like Cotton Candy). Also thanks to Silverdawn's auctions on eBay for comb and brush details. Ember (1st baby, in blue, pink and lavendar versions) was available as a UK mail order at this time, as I had friends who owned her! White with mauve roof, came with lots of accessories (Brandy the Dog, fences, jumps, trophies, bed, flags (I have 2 of 3), saddle, bridle, reins, weathervane, window boxes, plain mauve comb, yellow heart brush). Lemondrop the pony came with this set. Information source: 1984 MLP leaflet. Blue with white base and door and mirror sticker at back. Lots of accessories (Twinkles the kitten, yellow "straw" hat, white "flowers" hat, saddle, bridle, reins, basket and carrying strap, plain pink comb, pink heart brush with hanging loop, pink felt blanket). Peachy the pony came with this set. 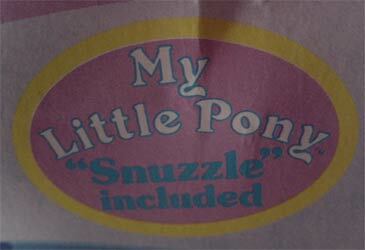 Additional info: for some reason, I am convinced I once saw a version with Snuzzle instead. I may be wrong. An update on the "Snuzzle Parlour"! In August 2005, I was send some pictures of it by Nicola Cooke, from the U.K. Box and closeup to show it was listed as Snuzzle. The box shows both Hasbro UK and Hasbro US contact details.Many thanks to Nicola for sending me these and letting me use the pictures on my page! Information source: ponies owned, and 1984 MLP leaflet. The UK were missing sets that the US had..
We did not get the Unicorns and Pegasus (Glory, Firefly, Medly, Moondancer,Sunbeam and Twighlight), which was a shame, since these were the main characters in the UK MLP comic at the time. The second set of normal-type Earth Ponies included new moulds, the "shy" pose for Bowtie and Applejack, and the sitting pose for Bubbles and Seashell (not used in any other sets). Information source: ponies owned, and leaflet that came ponies, publication date 1984. Note that Cotton Candy and Blossom were repeated from the first set, but I believe these came with flower brushes instead of plain combs. This was my favourite set at the time. The first UK set with unicorns and pegasi, and with that many hair colours! Each came with a brush AND comb. Comb/brush details only known for those I got new. Pink with blue turrets, came with lots of accessories (Spike the baby dragon, mirror,horsehoes with holder, chest,table, goblets,crown, mauve blanket, blue damsel hat, 2 hoop jumps, working drawbridge and Spike's lift). Yellow star shaped brush, pink ribbons. Majesty the pony came with this set. Information source: Pony and accessories owned and 1984 MLP leaflet. We got the 1st set of Sea Ponies in the UK, but the set was a little different. Only 1 was similar to the US set (which was made up of Seawinkle, Sealight and Wavedancer). The UK Wavebreaker is basically Wavedancer with a different shell stand. A Sea Pony is the MLP equivalent of a seahorse and has fins/tail rather than legs. Tail length: curled seahorse tail, not hair tail. This set included new moulds, the rather hauty prancing one used for Posey and Lickety-split, and the rather ugly bent front leg, looking-over-shoulder pose used for Cherries Jubilee and Tootsie. Poor Tootsie tends to be near the top of everyone's hate list due to this mould and her colouring. Bowtie and Applejack were repeated (but not in the U.S) in the Collectors' pose (rather than the "shy" pose). There was even a special record/tape giving little songs for each in this set! (The record was mail-order only). Bowtie, Lickety-split and Cherries Jubilee were (as far as I know) the first ponies with curled hair. Also thanks to Cherries Jubilee's backcard! Of this set, Baby Bowtie (with her stroller) and Baby Applejack were not sold in the U.S. These babies came in a "Play and Care" set, rather then on a normal bubble-fronted card. They came with boxed "Snugfit" nappies, bottles, "Baby" necklaces and some had rattles. Party Time - red feather-edged party coat with silver "crown"
This pink, heart-shaped box with a rainbow at the top had Cotton Candy pictured on the front. This came with Butterscotch the pony, and some of the showstable items. Note that this set was also known to come with Snuzzle (info from Beatrice Hannah).These were a pink saddle, reins & bridle, red "roof" jump, red jump with yellow bar, yellow trophies, yellow heart brush with looped handle on back and red 1st, 2nd and 3rd place rosettes. I don't own this set! I DO have the US version, which oddly, I bought with original box,leaflet (but no pony), in the UK, 2nd hand. This was similar to the U.S. waterfall set, apart from the colours and the pony (NOT Sprinkles the pegasus in the UK). Set consisted of: green pool base, with sun, and rainbow/cloud shower attachemnt, "Duck Soup" the duck pet, pony bubble bath, mauve curlers, pink comb with rounded handle, sponge on a brush-shaped plastic handle. Cascade the pony came with this set. Grooming Parlour, Dream Castle and Show Stable sets were as for the previous year. This set contained repeated favourites, Posey and Cherries Jubilee. The remaining 4 were exclusive to the UK. Very bight in colour, with symbols picked out in glitter (apart from Hopscotch). Gypsy was the first unicorn to NOT have a different coloured streak in her mane. Posey and Cherries Jubilee were very slightly different from their previous version. The marking were much darker in this set (similar to those underneath the flocking on the US So-Soft versions). Information source: ponies owned, and leaflet that came ponies, publication date 1986. 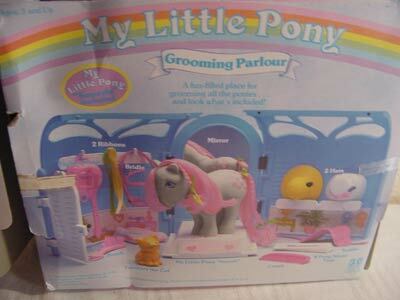 The Grooming Parlour, Dream Castle and Show Stable sets were as for the previous year.